^ Taylor, Alan. 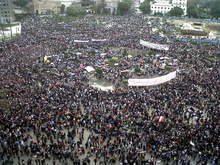 "Millions March in Egyptian Protests". The Atlantic. Retrieved 2017-05-02. ^ "The Simplest Explanation of Egypt's Revolution You'll Ever Read". TakePart. Retrieved 2017-05-02. ^ Staff, By the CNN Wire. "2 in Egypt torch themselves; 1 dead". Retrieved 2016-11-19. ^ Ehud Yaari (30 January 2011). "צפו: סיור וירטואלי במוקדי המהפכה" [Watch: Virtual Tour revolution centers] (in Hebrew). Israeli News Company. Retrieved 2013-08-14. 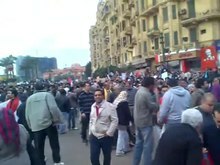 ^ "Violence Erupts in Cairo; Army Mostly Stands By". Retrieved 2016-11-19. ^ "Egypt protests: camel and horse riders who invaded Tahrir Square say they are 'good men'". Telegraph.co.uk. Retrieved 2016-11-19. ^ Guynn, Jessica (2011-02-02). "Google's Wael Ghonim is missing in Egypt; company asks public for help finding him". Los Angeles Times. ISSN 0458-3035. Retrieved 2016-11-19. ^ "New Egyptian law criminalizes protests". Al Masri Al Youm. 23 March 2011. Archived from the original on 2011-12-28. ^ "Egyptian army issues 48-hour ultimatum". Al-Jazeera English. July 1, 2013. Retrieved February 4, 2016. ^ CNN, From Ben Wedeman and Amir Ahmed,. "3 dead after thousands protest in rare Egypt outpouring". Retrieved 2016-11-19. ^ Rosenberg, David (24 January 2011). "Self-Immolation Spreads Across the Mideast, Inspiring Protest, Controversy". The Media Line. Archived from the original on 27 April 2011. Retrieved 25 January 2011. (Subscription required (help)). ^ "Egypt bomb kills 21 at Alexandria Coptic church". BBC News. 2011-01-01. Retrieved 2016-11-19. ^ Fahim, Kareem; Stack, Liam (2011-01-01). "Coptic Church in Egypt Is Hit by Fatal Bomb Attack". The New York Times. ISSN 0362-4331. Retrieved 2016-11-19. ^ Kotb, Amrou (2013-10-31). 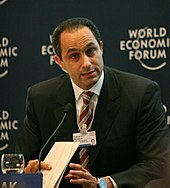 "In Egypt, Inclusive Democracy is no Longer just a Suggestion". Masr or Egypt. Retrieved 2013-12-06. ^ "Background Note: Egypt". United States Department of State. 10 November 2010. Archived from the original on 2011-01-26. Retrieved 22 September 2013. ^ a b Eltantawy, Nahed; Wiest, Julie B. (2011-09-02). 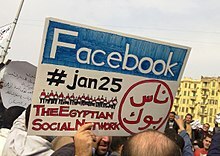 "The Arab Spring| Social Media in the Egyptian Revolution: Reconsidering Resource Mobilization Theory". International Journal of Communication. 5 (0): 18. ISSN 1932-8036. "University on the Square: Documenting Egypt's 21st Century Revolution". Egypt: American University in Cairo. Archived from the original on 2012-11-26. This page is based on the Wikipedia article Egyptian revolution of 2011; it is used under the Creative Commons Attribution-ShareAlike 3.0 Unported License (CC-BY-SA). You may redistribute it, verbatim or modified, providing that you comply with the terms of the CC-BY-SA.